Speed Analyzer gathers information about how fast a page is rendered. It's a tool that can be used to answers questions like "Why is my website slow?" or "Why is this page slow"? Builds a timeline based on when various events in concrete5 are triggered. 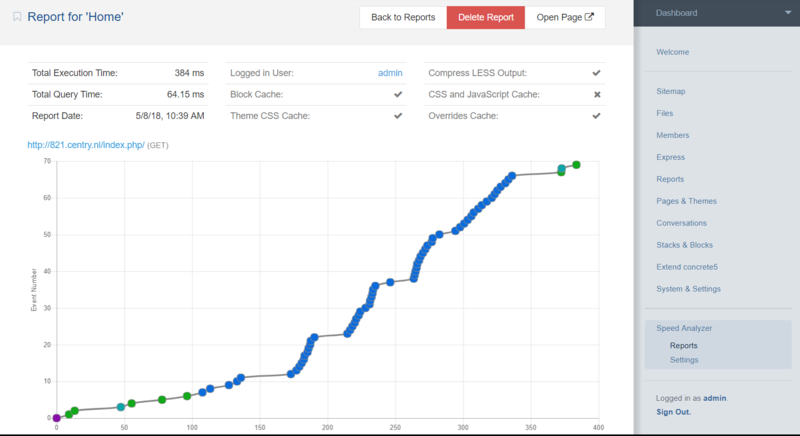 An interactive graph immediately shows bottlenecks in the code. Help sections explain what all the events do and how the data can be interpreted. Advanced logging of queries that have been executed before each event. Speed Analyzer is on Slack! Join the #speed_analyzer channel to get answers. Also check the blog post about performance in concrete5, it contains a lot of tips and tricks to make your website or application faster!